It’s the ice age. You’re a Neanderthal living in a cave. Obviously, you need to start a fire if you’re to have any hope of survival. But how? It might take you a while to work out how you’d start your ice age fire. Some researchers think it took the Neanderthals longer. In fact, they think Neanderthals never figured it out1. Fortunately for Neanderthals’ reputation, Andrew Sorensen and two other researchers have found some strong evidence against this hypothesis: rocks Neanderthals used as fire lighters2. Does your swiss army knife have a lighter? Neanderthals’ did. For a good chunk of Neanderthal history, they made handaxes. These symmetrical tools were both beautiful and practical. They were the swiss army knife of the stone age and could be used for anything from butchery to hole digging (and maybe even finding a mate). We know all of this thanks to microwear analysis, which looks for the unique damage “fingerprint” these activities leave behind. However, not all of these fingerprints have been identified. 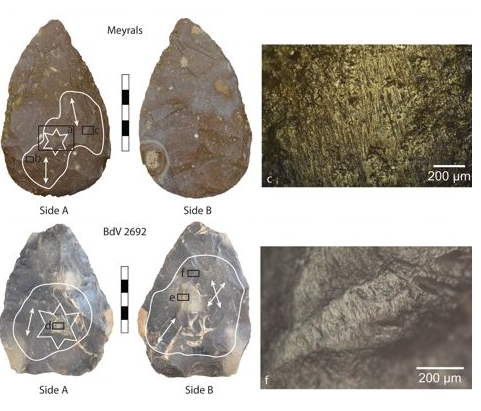 At least 59 handaxes have been found in France with mysterious abrasive marks2. This damage seems to be the result of rubbing or striking the handaxes with another rock, but what or why they were hitting remains a mystery. Could it be the missing evidence of fire? Andrew Sorensen and company suspected as much so began experimenting. They used replicas of these Neanderthal tools to start a fire in various ways. Additionally, they also did a few other non-fire activities with them. This way, they could check the resulting damage fingerprints to see which matched up better to the Neanderthal tools2. Plot twist: the Neanderthal handaxes look like they were used to start fires2. Specifically, it looks like the Neanderthals were using their handaxes to strike another hard mineral, possibly pyrite. This makes a lovely spark that could be used to start a fire. However, Neanderthal ingenuity doesn’t end there. They may well have been using chemistry to aid the process. See, manganese dioxide has been found at many of their camps. It turns out that if you grind this material up and sprinkle it over kindling it becomes much easier to light3. All of this is a big turn around for Neanderthals. Before this research came along it was debatable if they could even start a fire. Now, it seems clear that they were pretty great at it. They could make the right tools for the job, pick out good materials for striking, and maybe even throw in a bit of chemistry to boot. Of course, not everyone finds this convincing. Sure, the microwear evidence matches up with these tools being used to start a fire; but there’s a possibility it might match better to another activity we haven’t examined yet. Thus, this evidence remains a bit circumstantial. Fortunately for Neanderthals’ reputation, Sorensen et al. aren’t resting on their laurels. They’re going to start looking at this damage in even greater detail to look for any traces of the objects these tools were struck against. If it’s pyrite, or some other good fire starting material as they suspect, this would really seal the deal that these rocks were used as ancient lighters. Dibble, H.L., Sandgathe, D., Goldberg, P., McPherron, S. and Aldeias, V., 2018. Were Western European Neandertals Able to Make Fire?. Journal of Paleolithic Archaeology, pp.1-26. Sorensen, A.C., Claud, E. and Soressi, M., 2018. 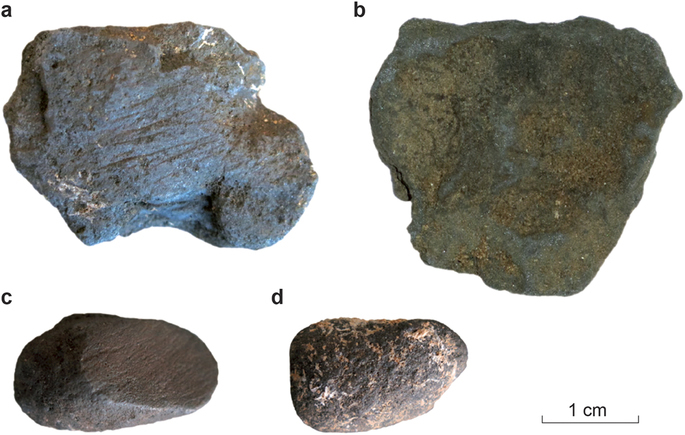 Neandertal fire-making technology inferred from microwear analysis. Scientific reports, 8(1), p.10065. Heyes, P.J., Anastasakis, K., de Jong, W., van Hoesel, A., Roebroeks, W. and Soressi, M., 2016. Selection and Use of Manganese Dioxide by Neanderthals. Scientific Reports, 6, p.22159. Previous post: Neanderthal cave art is fake news? I like this idea, because it opens up different ways of looking at Neanderthals and their ways. You can imagine that it probably takes a good amount of skill and effort to make a really good hand-axe, so it follows that the users might have a favorite one, and carry it around, or think that they wish they had a better one, or get pissed when they break one, or try to trade a crappy one for a good one, or something else of value. Also, I wonder if they would then carry chunks of pyrite around with them, thus always having a light, as you suggest by calling the tool a lighter. Iron pyrite, is all over my finds and many other paleolithic axes in collections all over the world. But what I don’t get is the ‘surprise?’ that neanderthals apparently had fire? They had birch tar didn’t they? that needs fire and some considerable skill to get the temps right. And yes I have birch tar on many of my figure stones and flint tools too, making them undoubtedly artifacts, but paleoanthropologists are unlikely to accept that any time soon, as my artworks disprove just about everything they have to say about the old stone age and the timelines involved in current theory. It’s not so much that they had fire, but that we’ve found how they started it. These sorts of insights into day-to-day life are always appreciated. Any Ideas on the age’s (or the range of the 59) put forward for those hand axes Adam? As those two examples lack any obvious figuration, this could help unravel the mystery as too who was using the figure stones, and even produce a good theory as why they died out and we didn’t. They’re all from the Middle Palaeolithic, which ran from 300-30 kya.